Driving is a privilege, not a right. And by toughening its laws against drunk driving, distracted driving, and driving without insurance, the Ontario government is making clear that it is the law, not drivers, who “rule the road” in Ontario. Section 140(1) of the Highway Traffic Act, the Ontario legislation that regulates the licensing of vehicles and classification of traffic offenses, makes it an offence for Ontario motorists to fail to yield to a pedestrian in a pedestrian crossover or walkway. Drivers found guilty of failing to yield to pedestrians at crosswalks and crossovers will see substantial harsher penalties. Prior to September 1, 2018, the maximum penalty was a $500 fine and a reprimand of three demerit points. Now, Ontario motorists will face a $1,000 fine and a hefty four demerit points. Pay attention to the road! A momentary lapse of attentiveness will now cost Ontario motorists more than ever before. Ontario motorists convicted of distracted driving will now face a minimum fine of $1,000 and three demerit points, an increase from the current fine of $490. Police are planning blitzes (in full uniform and undercover) to catch drivers texting, or even just looking down at the cellphone concealed in their lap. Can you fight the high fines? Highway Traffic Offences have seen growing fines and penalties in recent years. 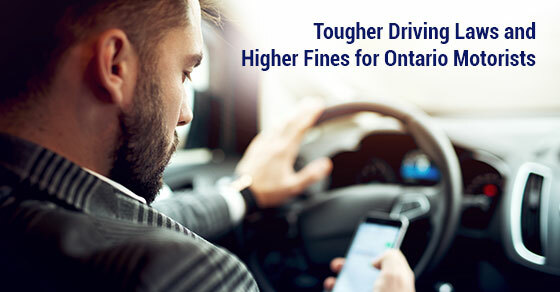 Ontario’s enforcement of tougher penalties for driving offenses will see a surge of Ontario motorists seeking relief against the minimum imposed fines. Section 59(2) of the Provincial Offences Act allows the court to exercise discretion to impose a fine below the minimum imposed fine where exceptional circumstances exist, rendering the fine unduly oppressive, and otherwise not in the interest of justice. The offender must show, on a balance of probabilities that “exceptional circumstances” exist, rendering the imposition of the minimum fine unduly oppressive and not in the interests of justice. A wealth of case law has explored what constitutes “exceptional circumstances.” In the recent case of R. v. Clarke, a motorist who failed to possess and maintain insurances saw a reduction in his fine. The court in R. v. Clarke cited that Mr. Clarke’s significant mental health issues contributed to his inability to possess insurance. The court also maintained that the potential reduction in a fine must still meet the goals of deterrence – both general and specific. The imposition of fines must not only deter the individual offender from committing the respective offense, but also the general public. In R. v. Ade-Ajayi, the court reduced Mr. Ade-Ajayi’s fine substantially. The court identified Mr. Ade-Ajayi’s financial precariousness as an “exceptional circumstance.” Mr. Ade-Ajayi was a recipient of the Ontario Disability Support Program (“ODSP”), was burdened by thousands of dollars in student loans, and was supporting his wife and two dependent children on his modest income. The court maintained that the legislative purpose of minimum fines was to incentivize compliance with the law. This purpose was to be balanced with the individual circumstances of the offender. The appellant in R. v. Baritzfailed to convince the court that his minimum fine should be reduced. Mr. Baritz was found guilty of operating a motor vehicle without insurance upon colliding with another vehicle. The court justified the denial of Mr. Baritz’s plea for a reduction in his $5,000 fine, reasoning that the imposition of the high minimum fine for operating a motor vehicle without insurance was to make it more financially onerous to offend than to bear the required cost of insurance premiums. The court further reasoned that the purpose of the fine was in fact to cause financial hardship. The question of whether “financial hardship” is unduly oppressive requires the balancing of the interests of justice, and how the imposition of the minimum fine would adversely affect this. The court referenced the consideration of costs in financing, operating, maintaining and insuring a motor vehicle in making this determination. The appellant in R. v. Fagbemisimilarly failed to persuade the court to reduce his minimum fine of $5,000 for operating a motor vehicle without insurance on the basis that he was a college student. Mr. Fagbemi maintained that he was a young college student, and could not afford to pay for compulsory insurance. The court, as in R. v. Fong maintained that the $5,000 minimum fine for operating a motor vehicle without insurance was legislatively intended to exceed the cost of insurance for the highest risk group of motorists – those 16 to 25 years of age. The legislative purpose behind the burden of such a hefty fine for failing to ensure a motor vehicle is to incentivize those who wish not to comply with obtaining insurance. Ontario continues to have some of the toughest driving laws in North America. This makes it harder for drivers, but is intended to protect the safety and security of the community. Be safe, pay attention, and share the road, and you will be fine. Disregard that advice and you will be fined!